The two veteran actresses Rekha, Shabana Azmi couldn't stop praising each other at a recent award function. Rekha seemed thrilled to be sharing the stage with Shabana. 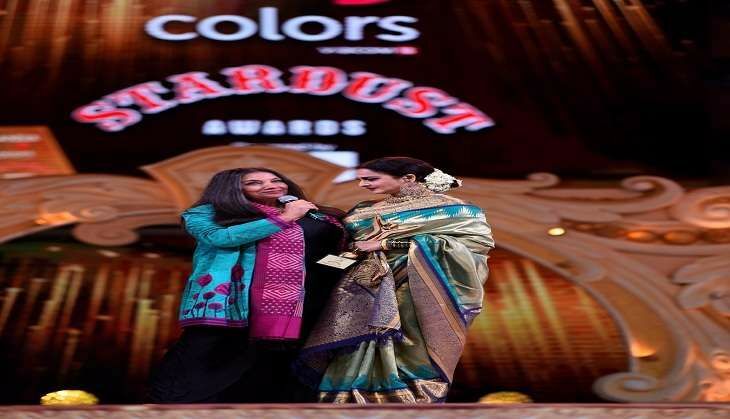 Before presenting Rekha with the award, Shabana Azmi showered her with some admiring words like "You have been my friend and colleague for many years. Your body of work is truly incredible; and the way you still carry yourself. You absolutely deserve it." Akhtar added to the occasion by saying, "Normally when I have to present such Lifetime Awards, I am expected to say a few words about the recipient. But this time I can get away with just saying, 'Ye Rekha hai'." On hearing Javed's words, Rekha responded "Javed sahab, you know who deserves this credit and it's none other than your better half. I have grown up with the Azmis and they have been a huge inspiration for me. Thank you for the honour."